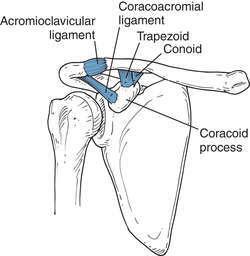 the strong compound ligament that unites the clavicle to the coracoid process; it is subdivided into the conoid ligamentum and the trapezoid ligamentum. The free upper limb is passively suspended from the clavicular "strut" by the coracoclavicular ligament; the ligament also plays an important role in preventing dislocation of the acromioclavicular joint. The strong ligament that unites the clavicle to the coracoid process; it is subdivided into the conoid ligament and the trapezoid ligament. The free upper limb is passively suspended from the clavicular "strut" by the coracoclavicular ligament; the ligament also plays an important role in preventing dislocation of the acromioclavicular joint. 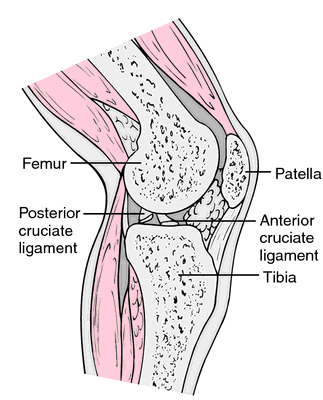 Synonym(s): ligamentum coracoclaviculare [TA] . Leopoldo M.A., Italian anatomist, 1725-1813. Structural properties of the intact and the reconstructed coracoclavicular ligament complex. Cyclical loading of coracoclavicular ligament reconstructions: a comparative biomechanical study. Reconstruction of the coracoclavicular ligaments with tendon grafts: a comparative biomechanical study. Recently, Carofino and Mazzocca and colleagues reported on the outcome of 16 patients with a type III or V injury who underwent anatomic coracoclavicular ligament reconstruction. Biomechanics of the coracoclavicular ligament complex and augmentations used in its repair and reconstruction. Operative findings included fibrous nonunion, with gross motion at the distal clavicle and intact coracoclavicular ligaments. 1,4,5) Most recently, Ogawa and colleagues divided these fractures into two types, based on the anatomical relationship of the primary fracture line relative to the attachment of the coracoclavicular ligaments. Type II fractures are displaced, and there is associated rupture of the coracoclavicular ligament with the proximal clavicular segment typically pulled upward by the sternocleidomastoid muscle. Type I fractures are nondisplaced, and the coracoclavicular ligaments remain intact. Neer distinguished the Type II distal clavicle fracture as one in which there is some degree of disruption of the coracoclavicular ligaments. Even when nonunion does occur, functional healing of the coracoclavicular ligaments can render these patients asymptomatic.